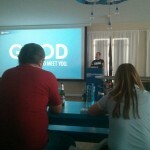 The 18th Web Performance Meetup took place in our Goodgame café yesterday with 40 participants attending. The meetup is a platform to exchange experience, problems, tools, and recipes for success regarding performance of web-based and mobile applications, and takes place about ten times each year. The evening kicked off with a few words about Goodgame Studios from our Chief Technical Officer Stefan Klemm. Then our Frontend Team Lead Lars gave a talk on “Traffic from over 200 countries – performance optimization in terms of global delivery”. A very important topic, especially here at GGS. Our websites are accessed all over the world, and it is a challenge to ensure that every visitor gets the same good user experience in terms of performance. Our Frontend Team has managed to achieve this, and Lars shared his knowledge with our guests in his presentation.